A warm, hazy autumn afternoon in Port Appin. Pierhouse guests enjoy the sunshine on the Ferry Bar terrace; there's the sound of a raft of eider ducks as they drift past the skerries and, at the pier, the 5 o'clock passenger ferry is making ready to take locals back home to the isle of Lismore. Such was the scene outside The Pierhouse on Sunday afternoon as Tom Bell, editor of Alastair Sawday's British Hotels & Inns, presented Nick and Nikki with the hotel's latest accolade - a Favourite Newcomers Award in Sawday's 2016 guidebook. 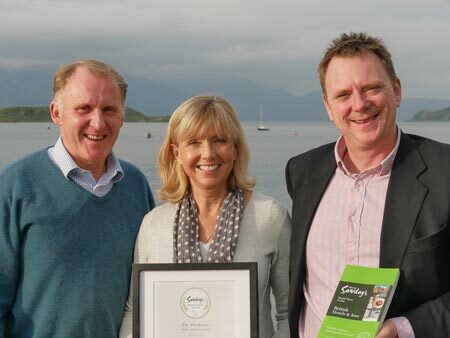 Alastair Sawday's present the awards to "very special places that typify the Sawday ethos". Nick commented "Nikki and I are delighted to receive the Favourite Newcomers award on behalf of everyone in the hotel team who has worked so hard over the busy summer season. It's a fantastic achievement made even more special by receiving the award from Tom in person." The Newcomers award comes hot on the heels of The Pierhouse taking top spot in Alastair Sawday's list of Britain's 20 most romantic hotels & B&Bs as featured recently in the Daily Mail. Alastair Sawday, described as 'the doyen of travel guides' shared his 20 favourite unsung hotels and B&Bs and we're very excited to see The Pierhouse Hotel top of that list. Alastair Sawday, writing for the Daily Mail, revealed "The Pierhouse sits at the end of the road on the shores of Loch Linnhe, with views across to Lismore and the mountains beyond. Inside, glass walls frame the view, there’s a smart bar for a wee dram, a white-washed snug with sofas in front of a wood-burner. Chic Scandi rooms have a wing to themselves, so expect peace and warm colours, padded bedheads, smart fabrics and robes in sparkling bathrooms." Turning to food, the review continues "Watch the odd boat chug past while digging into langoustines, oysters, scallops and lobster Thermidor fresh from the water in The Pierhouse’s restaurant."